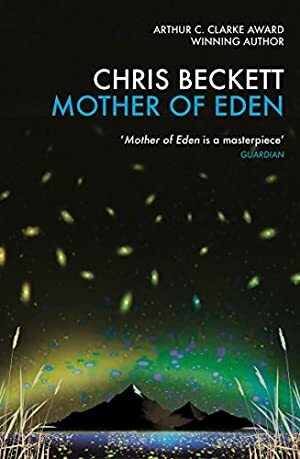 Mother of Eden has been shortlisted for the British Science Fiction Association Novel of the Year Award, 2015. Generations after the breakup of the human family of Eden, the Johnfolk emphasise knowledge and innovation, the Davidfolk tradition and cohesion. But both have built hierarchical societies sustained by violence and dominated by men - and both claim to be the favoured children of a long-dead woman from Earth that all Eden knows as Gela, the mother of them all. When Starlight Brooking meets a handsome and powerful man from across Worldpool, she believes he will offer an outlet for her ambition and energy. But she has no idea that she will be a stand-in for Gela herself, and wear Gela's ring on her own finger. Log In to track Chris Beckett on eReaderIQ. to be notified each time the price drops on any book by Chris Beckett. to stop tracking Chris Beckett. We started tracking this book on March 23, 2015. This book was £8.79 when we started tracking it. The price of this book has changed 95 times in the past 1,495 days. The current price of this book is £0.99 last checked 57 minutes ago. The lowest price to date was £0.99 last reached on April 15, 2019. This book has been £0.99 3 times since we started tracking it. The highest price to date was £10.44 last reached on March 28, 2016. This book has been £10.44 2 times since we started tracking it. We last verified the price of this book about 57 minutes ago. At that time, the price was £0.99. This price is subject to change. The price displayed on the Amazon.co.uk website at the time of purchase is the price you will pay for this book. Please confirm the price before making any purchases.